Yoga Raving: A Healthier Alternative to Clubbing? For many yogis, yoga isn't just a fitness routine or a meditative practice. It's a LIFESTYLE. In fact, there are certain styles of yoga being taught today that encourage living by traditional yoga philosophies on a daily basis, like positive thinking, ahimsa (non-violence), or vegetarianism. But before you take on a drastic lifestyle change to adhere more to yoga's principles (because yes, asana is just ONE part of yogic practice), you should know there are small, easy ways to start living healthier -- starting with how you spend a weekend night out. Instead of hitting the clubs and getting sloshed like you usually do, why not grab your fellow yoga-practicing buddies and go to a "yoga rave"? 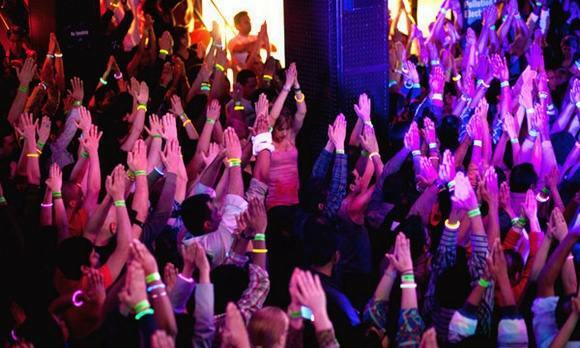 The Art of Living Foundation came up with a great way to show practicing and would-be yogis that yoga doesn't have to be a shut-out-the-world-and-focus-on-myself practice, by organizing a yoga rave a few days ago at Pacha, a nightclub in Manhattan. The yoga rave at Pacha had Indian and organic food, non-alcoholic drinks, and of course, fun upbeat music ravers can dance to. Forget the cliched Top40 music being played at clubs today -- at a yoga rave, you get "rock mantras" or yoga chants fused with rock beats. Of course, this isn't the first "yoga-centric" social event to ever take place. But taking a gathering like this to more "mainstream" venues like nightclubs definitely helps draw more people into doing yoga and for them to appreciate the healthy lifestyle that yoga promotes. New Age partying, hipster clubbing -- call it what you will, but it's definitely a great idea for making yoga a social event and bringing more attention to this wonderful practice. Know of similar events in your city? Drop a comment below and let us know!